For me, for many years, exercise was all about calorie burn and the quest to take up less space. But these days I crave something more akin to moving meditation. I want calm and fresh air. I want muscles waking and all senses humming. I want a reminder that my body is not just a brain, and a pair of hands on a keyboard! That’s the theme of this month’s newsletter, zapped out just moments ago. I chat to five fabulous women who’ve found a way to move that truly rocks their worlds: tap dancing, hill walking, cycling through the desert, hot sweaty yoga, and swimming in the sea. The latter lass is Fiona Edmonds Dobrijevich, an artist and academic living in Sydney. We met a very long time ago after, ahem, she stumbled across a post I wrote about stalking Russian Olympic champion swimmer Alexander Popov around a supermarket. I have bloody adored her ever since. I want to dive into her stunning paintings. 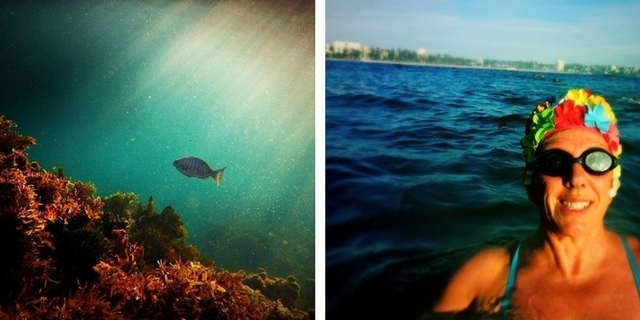 Her underwater Instagrams from her morning swims are mesmerising. I love her wicked wit, her lyrical writing, and the way she sees the world with all senses full, often from under the sea. When I sent her my questions, her computer was broken so she sent little audio files. As I transcribed her mellow Aussie tones, I knew I had to share the whole lot. From swimming with sharks to the smells of the sea to actually placing her hands on the fins of a whale, I hope you enjoy her gorgeous words. I’ve been swimming in the early morning, before the sun comes up, for about 24 years. Prior to that I’d always swam, but it was usually after work or after uni when the sun was going down. The morning swims started when I had a baby (who’s now 23). I had to get up early and do something nice with my day before I was occupied with mother things. I used to go to South Curl Curl, a fairly tough beach. It has a big 50m rock pool and the good thing about it is that it’s so exposed, the sea water is always going into it so it doesn’t get so cold. It was a good way of swimming in the ocean, without swimming in the ocean. A few years back the sea was so rough that the pool was in a state of disrepair and it was too dangerous to get out there. I remember a friend swam with a group down at Manly, in the marine reserve. My friend took me along and I’ve never missed a day since, unless I’m out of the country or something like that. I never thought I’d feel so attached to somewhere else, but the marine reserve is wonderful. The minute I swum there I knew it was impossible to find somewhere better. 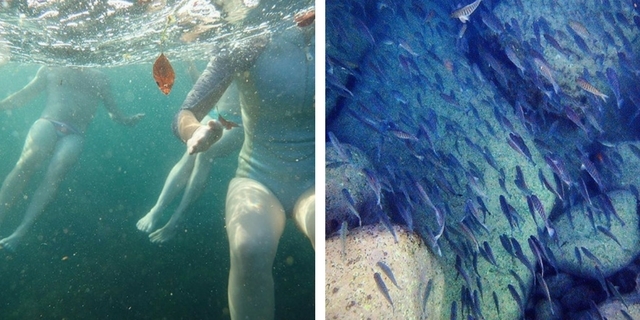 It’s full of fish, rocks, sharks, octopus, there’s even a couple of turtles there. It’s lovely wild swimming, so when it’s rough it’s rough. Not anything as bad as Curl Curl in terms of rough surf; it’s quite protected by a large headland. My little group swims around 5.30 – 6am. We do a couple of rounds of the bay. Sometimes we head out into the open sea. It is a bit of a trap for bigger creatures. When migration is on you can see the whales going down this route. We swim all year round, even in winter. You develop an attachment to people who will turn up because they don’t want you to be by yourself. 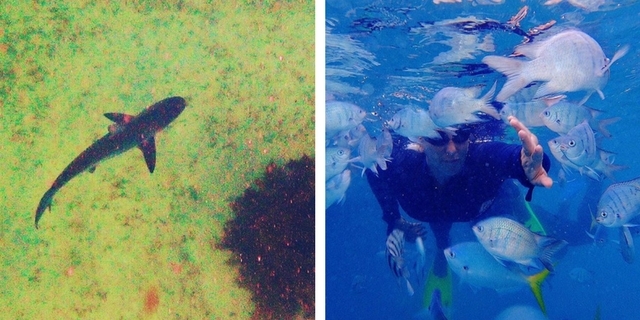 Even though it’s cold, pitch-black and a shark breeding ground, they’ll still show up and swim with you. If you encounter something dangerous or scary it’s one of those things that forges a bond between people – you’re sharing this experience together and it makes you close friends. I can’t be without it. It’s like I’m not actually separate from it. The smell of rough water is indescribable. When it’s all stirred up, the algae and the salt and iodine and everything is smelly and wonderful. It’s almost like pears. Pears with salt, if you can imagine that. Some of the other swimmers ask me, how do you always know when the surf is behind you? How do you know the exact time to duck and dive? I’m listening all the time to the sound of the surf, so I know exactly what’s roaring along behind me, whether it’s a big wave or a small wave; if it’s broken or not broken. You can also hear lots of really interesting things and I’m quite sure it’s the fish communicating. There’s a particular spot when you can hear an orchestra of clicking and popping and scrabbling. It’s not just the rocks but the fish making these funny little noises which I’d really love to record one day. It’s really beautiful. It’s a soothing noise. I think of paintings and colours while I swim. I try and sort my life out. I look at the way things flow this way and that. Because I’m an artist and constantly making things, of course I’m analysing everything visually. I make little paintings and drawings about it. With the other swimmers I’m often focused on the particular experience of swimming – rotating my body and breathing. You can get very focused on swimming fast. I’m the slowest in the group, really not that slow, but I’ve had a couple of health issues recently so I’ve slowed down a bit. You really have to concentrate on being like a fish. Or like a surfboard in some instances. You focus on being in a streamlined form to create the speed that will push your bulk along in aerodynamic way. So I do think about my body – about my spine, my chin tucked down, really being streamlined as I pull myself along. That’s a brilliant way of meditating because everything you’ve been faffing around thinking about – this colour would be nice, I’ll put some ink there, la la la, the fight I had with my husband the night before – really goes out the window – because I’ve got to think about swimming as fast as I can and the sound of my breath and every other little thing like that. My favourite season for swimming is probably autumn and winter. Swimming in the really cold water, in that beautiful, refined light is just something else. For the day to begin, to actually come into being, in a sense of lighting up, when you’re in the water with your nose just above the horizon, is really great. Everything seems just so much more intense. 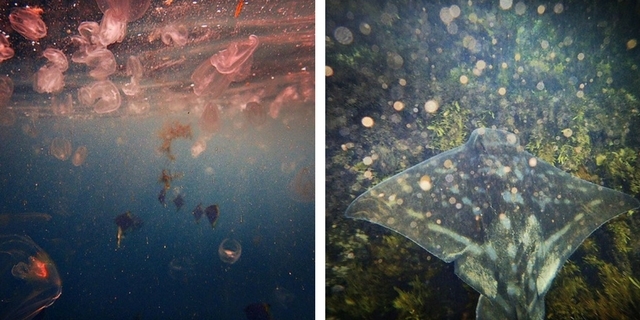 In the winter I also like to look at the phosphorescence, and the colours and light that occur underwater. When you move and the small phosphorous bioluminescent forms, and they’re tiny little plankton the light up through movement. It’s just something about it. I’ve been trying to make art about it, to photograph it, I bought a black light, but various technical issues have prevented me from capturing these things I really want to capture. I’m writing and researching about the experience of human beings and sea creatures – my upcoming exhibition deals with that. I’m constantly trying to refine all this information about what it means to be a human being in the ocean. I think it’s really important in this moment to look at how we exist in the world, and particularly the idea of separation of humans, culture and nature. I think it’s important to dissolve that boundary and realise it’s just a social or language construction, because we’re not really separate from that world at all. I’m now onto my eighth underwater camera. I use an Olympus TG4. I’ve lost, dropped, accidentally chucked them in the garbage. I have it strapped to my swimmers, tucked down the front, so I can be swimming along and grab it. It’s a little bit like Henri Cartier Bresson and that idea of the decisive moment – you know when something fabulous is going to occur. You can see the light, you can see the backdrop – you’ve just got to wait for it to come along. Someone might swim past and you just dive and you know it’s going to be nice. I carry the camera wherever I go and i’ve got quite practiced at doing it – I can also swim freestyle with one arm reasonably quickly. I’ve been practising a kind of free diving with my friend Maurissio who can stay underwater for about 8 minutes. I practice going under to the bottom. Because I’m so bouncy and buoyant I’ve learned how to cling to something at the bottom so I don’t go up. You just stop moving, get very still and wait for the fish to come. Or you look up at the surface. It’s a really nice thing to do; I usually do that towards the end of my swim. I like taking photographs in the dark. Not that they come out very often. I like trying to get photos of the sharks that are there but it’s usually murky. I’ve been chasing this same poor old dusky whaler around this week and I haven’t got any decent photos. She’s quite shy. One of these days… I live in hope. I really love sharks. The sharks here are so gorgeous. My favourite is the grey nurse which you see very rarely. It’s the one I look for when I swim out the headlands. The whaler sharks in the bay itself are so cute and adorable. They’ve got those sweet ears out the side like a cat. We get this media narrative of shark attacks over here. Fourteen people may drown in 24 hours, but then there’s one attack and there’s this outcry and political posturing. But there’s nothing done about people who can’t afford swimming lessons, or don’t know how to swim at the beach. The things I don’t like are stingers. 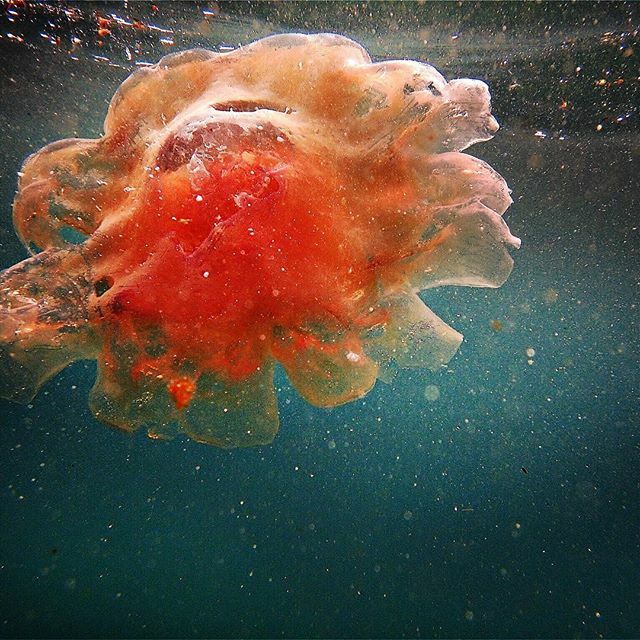 Bluebottles are one thing, but my nemesis is a relative of the Irukandji jellyfish. I’m covered in scars from it and it’s a vile thing, really painful. My dad died a few years back. I woke up the next morning after an awful day and thought to myself, I don’t have a dad. This is the first day of not having a dad. I hold to the idea that nature will reach out to you when you’ve lost somebody. It was a really awful day. It was July 26th and it had been stormy. The surf was huge, it was still pretty dark. I went down to the beach and I thought, I’m going to do it, I don’t think I should not. Part of me thought that I should mark this day by not going, but I went anyway. It was very fizzy white water. Very icy light. On this particular day I swam with my old friend Kent. Swimming with him was calming, like two old sea creatures going out into the surf together. The surf was really rough, but it didn’t matter because I had Kent there. We headed off and we kind of knew there was a whale somewhere. It was close. We took off across the bay. It was wild, rough and whippy. We got to the other side and noticed that back where we’d come from, a bunch of swimmers were backed up against the rocks, not moving. What are they looking at? What’s going on over there? So we swam back – at Olympic speed mind you. When we got to the swimmers they were all still and bobbing around near the rocks. It was at that point I looked down and realised I was directly over the top of a whale. It was looking up at me. I could not believe it. My first thought was, what if it comes up for a breath and I’m stuck to its blow hole? But to cut a long story short, this whale interacted with the group of us for about an hour. Every time it backed off, it came up to have a closer look at me. It was a Southern right whale. They do this funny motion where have their head down and their tail up, and it’s a way for them to look at things closely. It kept doing this. At one point it actually backed up to me, so that its tail flukes were right in front of me. I thought, this thing could kill me, it’s massive. Massive. Then its tail flukes were spread out in front of me. So I just put my hands on the whale’s tail. Both of my hands. It was so solid. It was a force. Like rock come to life. I just held my palms there. Then it really gently went forward so its tail was under the water. Possibly one of the most amazing moments of my life. I realised it was my dad. My dad give me that gift. My dad taught me to swim. He taught me to go under the waves and never be frightened. I’ve never been frightened in the sea. Well, maybe once or twice. But that’s my gift from my dad, who left me. And he sent me that whale to tell me goodbye. I haven’t seen that whale again. The next year when they were migrating south, it was very clear weather. Plain sailing. So it didn’t have to shelter in my bay. I always look out for it in the middle of July, in case it comes back. But it never has. I can’t imagine carrying out my day without having had a swim. I’m pretty addicted to it. It’s all endorphins. You know the whole thing where if you don’t exercise you get that funny headache? I’m fifty now, so things are starting to wear out. I have a bit of shoulder pain. A bit of this, a bit of that. I have to force myself to rest my tired shoulder. But it definitely is something that I need for my mood, for my thinking. I’m also aware that I need to other things. I do Bikram yoga, which is pretty taxing and intense. But the swimming, just getting your head under, is one of those things. A huge thank you to Fiona for letting me publish all her words. And also thank you to the wonderful Caro, Georgia, Paula and Shona who shared their stories on the newsletter too. If you’d like to read it, sign up here and it will be zapped to your inbox right away. What an amazing thing to do every single day. I can understand why she never tires of it. There is something very special about watching the sun come up every day, but seeing it from the water must be magical. Wow. Thanks so much for telling her story! I have a couple friends who swim in the Serpentine in London and really enjoy it. Also, nice to see a fellow tap dancer in the newsletter. All I can say is WOW!! What a beautiful, insightful post. I’m a Pisces myself, so I’ve always had an affinity for the water and the ocean! I was born in Colorado (USA), so when I saw the ocean for the first time, at age 10, I was speechless and teary! When I took a cruise for the first time, I cried hard from the balcony of our room, realizing how vast the ocean is and how small I am…yet God chose to make all that and little old me!! This post really brought those feelings back. Thank you Fiona for writing it, and thank you Shauna for sharing it!! LOVE LOVE LOVE!!! I agree – really amazing to read about Fiona’s adventures all the time. I am so inspired and impressed. Thanks for bringing this to your site or I never would have read it! I was entranced by the whale story especially! 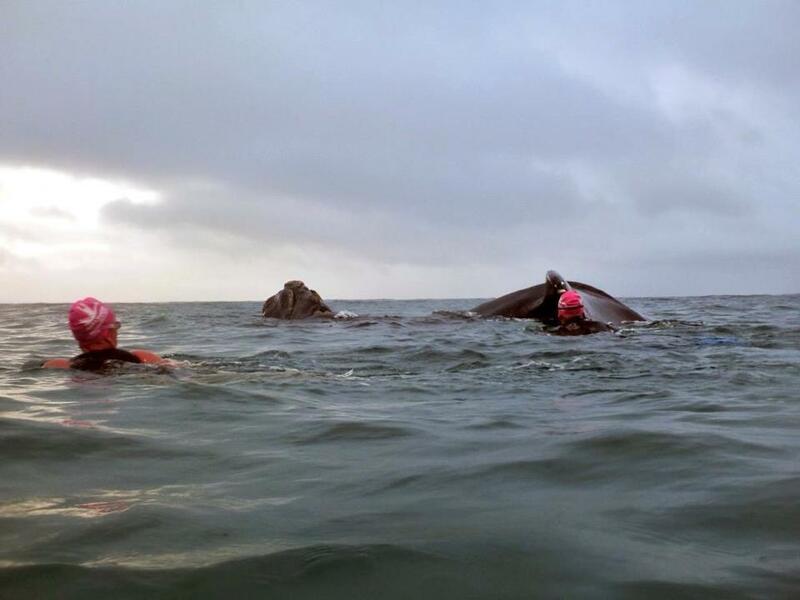 Every time I swim I wish I did it more – am in admiration of Fiona for doing it daily – must be just wonderful way to start the day but I don’t envy her the early mornings!. I do wish I could take such amazing photos! They are truly beautiful. Wow. I would be terrified to do that, but it’s lovely to read about it. I had forgotten that you “knew” Fiona too. She actually came and visited us some years ago. She’s amazing!